When you get down to it, all the people that I see in my various programs are trying to change some behavior or habit in order to achieve a goal in health and wellness. In order to lose weight, lower blood pressure, cholesterol, or blood sugar, or become more fit and functional, the chances are good that you will have to work on abandoning some poor health habits while at the same time learn new behaviors that will promote better health. Tovi, a 36 year old mother of 6 came to me with two main problems. She was 22 kilo overweight and she had just been told by her doctor that she was pre-diabetic. Because Tovi had a full time job as a systems analyst in addition to her family responsibilities, she knew that she had to be able to function fully and she certainly couldn’t afford spending time in the doctor’s office on a regular basis. Her doctor explained to her that if she would make the proper lifestyle changes, she would take care of the problem of overweight and get her blood sugar levels down to normal levels without medications and all of the side effects that comes with them. She was indeed encouraged by the prospect that her future health was in her hands but like anyone else in Tovi’s position, this would require changing some very ingrained behaviors. Tovi was someone who had to get her kids out of the house early and be at work on time. So, she skipped breakfast. At about 11 in the morning, she would be very hungry having only had a cup of coffee and one glass of water when she got to work. So she grabbed a cheese danish together with another cup of coffee depending on what was available in the company snack room. When it got to the 1 o’clock lunch break, she would eat a very large lunch as she was very hungry. She had a cup of tea and half a chocolate bar for dessert almost every day. Her workday was over at 4:00 and she had to get home to make sure she had supper ready for her kids. Usually while preparing supper, she picked at the food and then after eating with her kids, she might sit down and eat yet again with her husband when he arrived home at 7:30. Tovi was also pretty sedentary. The company picked her up and others in her neighborhood with a van every morning and she took a bus home. She worked at her computer all day and didn’t get much movement during her day, other than going between rooms in her office building or to the cafeteria to eat. Instead of just telling her to lose weight and exercise without instruction, Tovi’s doctor sent her to me for professional advice and coaching. At our first meeting, she seemed very anxious to get going and to accomplish everything as quickly as possible. It was almost as though she thought we would meet once, including a visit to my staff dietician, and she would be all set. I explained to her that the only way behaviors are going to change and stay changed is if we take baby steps. 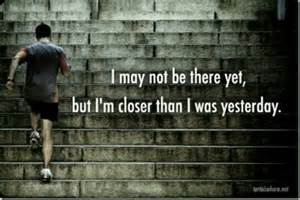 We need to do things one step at a time. Although Tovi was disappointed, she understood that when habits are so ingrained, there is just no such thing as pushing the “undo” button for a quick fix. And so we began our journey to good health. Her first assignments? Use the staircases at work, get off the bus one stop early on the way home, and walk an additional 20 minutes each night. The dietician had her pack up breakfast each night to bring to work and eat when she got there and to change the morning snack to a yogurt and a fruit. And so we started. 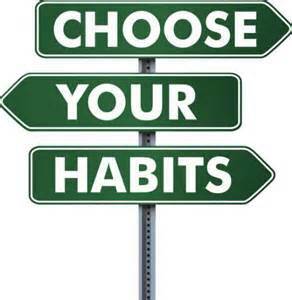 “Habit” is a word that has become exclusively associated with negatives. Habits have consequences. So bad habits have bad consequences and good habits have great consequences. Habits can make life easier. More accurately, they streamline behaviors to free you from the sometimes excruciating experience of making a choice. Let’s look back at our client Tovi. One of the changes we agreed she had to make was to walk 20 minutes every night. But this was something she had never done and often in the evenings, she would spend that time catching up on things with her husband while snacking on unhealthy choices, like ice cream. So two things had to happen here: 1) Tovi needed to stop eating ice cream each night and 2) she needed to do her walk. I enacted 3 of the criteria of behavioral change by Dr. B.J. Fogg. Now we have created a positive behavior. But what about that ice cream, which will certainly not help her lose weight? 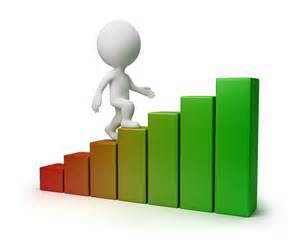 Our client realized that as she was making progress in enacting new positive behaviors, it made no sense to undo that progress. And this was all reinforced each week when she saw progress downward on the scale. These were the techniques we used over time to get Tovi healthy. It didn’t take terribly long before she was walking 35 minutes briskly each night. Three times per week, she eventually did a small 12 minute routine of muscle building exercises (and I made sure she recorded how good she felt afterward as positive reinforcement). She also began eating 3 moderate size meals daily with 2 small snacks in between the meals and was drinking 10 cups of water per day. Although we slowly got her to switch over to healthy choices for meals and snacks, twice a week, we built in ice cream for her in small but enjoyable amounts. 3 months after our initial meeting Tovi had dropped 9.5 kilo and her blood sugar numbers, both her fasting glucose and HBa1c were firmly in normal range. She was functioning better, had more energy and was meeting her responsibilities both to her family and to her boss at work with more vigor and with energy to spare at the end of the day. Her feeling good was now motivating her to slowly but surely get to her weight loss goal too. And how did she accomplish it? One small step at a time and making sure that each behavioral change she chose to make was somehow attached to a behavior that had become firm and anchored. She also learned how to tell herself or write down a positive emotion after she accomplished each change.